The 400 leaf Growing Tree is perfect for a Capital Campaign and Donor Appreciation. Individual leaves are grouped on plexiglass panels and mounted in clusters. Tree kit comes with a paper template for easy installation, extra leaves, screws, and a screwdriver. Special engraving rates available for the individual leaf plates. 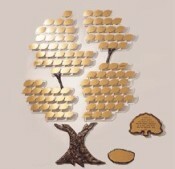 You can purchase the tree online and we can contact you for engraving details. 11 Ft. Wide X 5 Ft High. 400 gold leaves standard, plus 14 branches and one bronze cast trunk. Small acorns and mini trees seen in the picture are not included, but can be ordered.